A student composing a tweet. It's funny, I've been using twitter a fair bit with my students this past year but as I went to find a post about it to share with a colleague on twitter I discovered I've never actually blogged about it. It's time to fix that. My class and I have used twitter as an incredible connecting, sharing, and learning tool. We've used it for many different purposes and the reality is there is always another way we could be using it. The great thing about Twitter is that it's one of the easiest ways to bring the world into your classroom. It's available for access from almost every where in the world. Tweets can be left at any time zone but you can check them when it is convenient for you. It doesn't hurt that it's engaging, and often the feedback is instant for my students. Nothing like sending an author a tweet and five minutes later she's writing you back. But I'll get more into that a bit later. 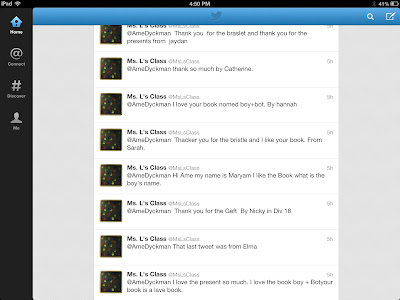 To begin with I've created a class twitter account at @MsLsClass. As class this is where we tweet from. Since my students are only six and seven they are far too young to have their own account so any tweet they ever write has to go through me before it goes live to the world. Sometimes I have to admit it's a bit of a pain, particularly when we are back channelling at the same time, but my students understand why and I know it's my responsibility. Thankfully, most of the time a quick glance by me, it is after all 140 characters or less, I can quickly say , "tweet away". But what do we tweet? 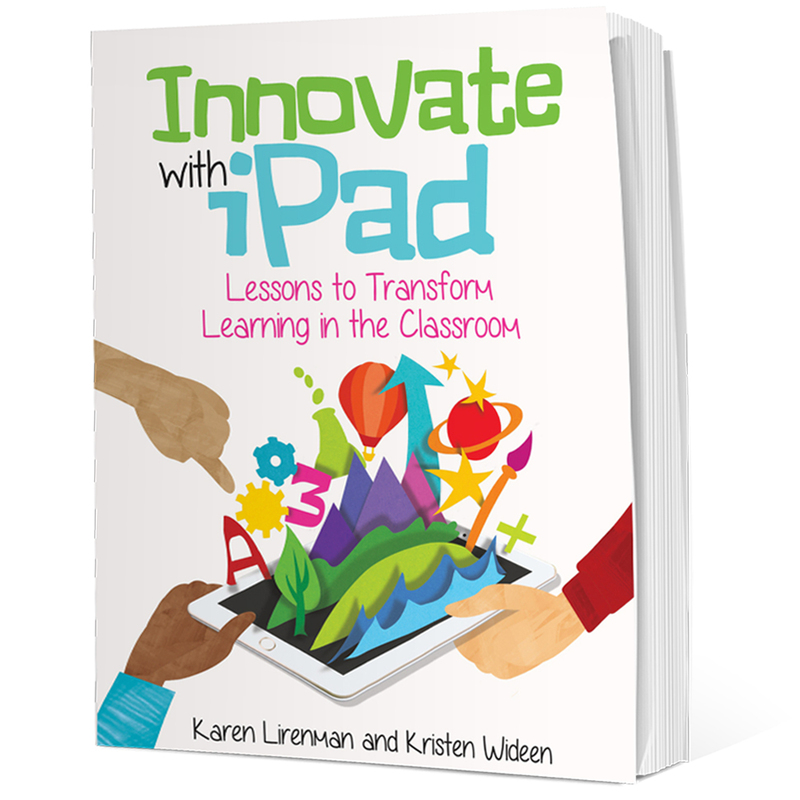 The simplest thing to tweet is what is happening in our classroom at any given moment. What are we learning? What can we share with the world? Often we'll be in the middle of some cool discoveries and some one will say, "Ms. L, can we share this with the world?" A tweet is then quickly written, or an image is taken, and it's shared with the world. It's a great way for the parents to know what's going on in the classroom at the exact time a tweet is being sent. Other times we use twitter for specific purposes. In fact we actually create our own hashtags so that all our learning can go to the same place and others can join in on our fun too. This past year we used it for math a couple of times. The first time we tweeted to #2d3dshapes where we gave clues about two and three dimensional objects hoping others would try to answer our clues. So for example some one in the class tweeted, "I look like a can, I have two circle faces, what am I?" Other children answered our tweets and provided us with clues to figure out too, which we did. This term we also tweeted out math story problems to the hashtag #mathstory which we created as a class. Here we would share number stories with the hopes that other children would respond back to them and share some math stories with us too. This hashtag was extremely popular but the most unexpected bonus was that when people responded to my students tweets, they showed them how they solved the problems. While that's great, the real power was in the fact that so many children solved the exact same problem in so many different ways. Some sent us images of their drawings, some sent us number sentences and number stories. Many different types of mathematical thinking was being shared with my class which opened up my students to so many different ways to solve their number stories. And yes, as their teacher I did show them many different ways too but it was cool to see the answers come back to us in so many different ways. Of course as their teacher it was great to see them excited to answer other students math stories too. We also used twitter this year to connect with people. The thing with twitter is that you can direct a tweet to a specific person. 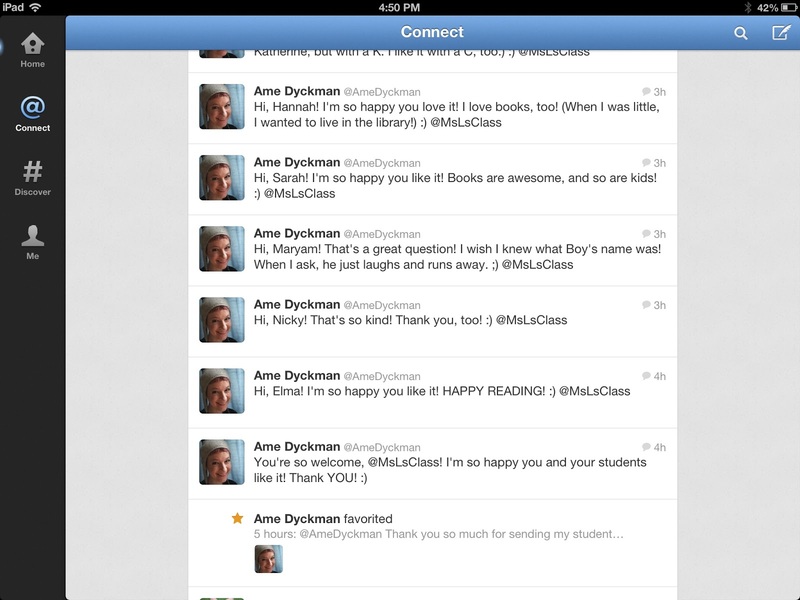 In one case we tweeted Ame Dyckman, a wonderful children's author. 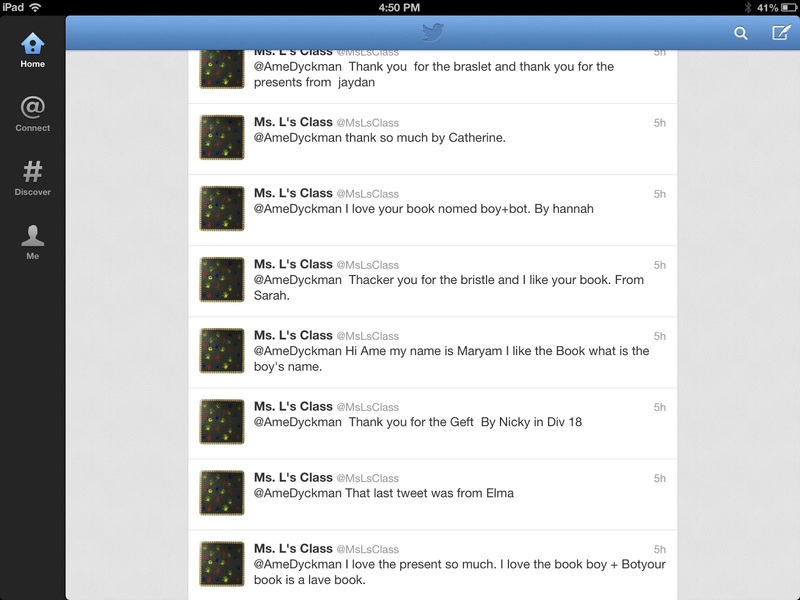 We read her book Boy + Bot and really liked it and wanted to tell her such. So we did, through my twitter account. She then got a hold of me and sent some special treats for my student who wanted to tweet her to thank her. This time instead of using my twitter account we used our class twitter account. Each student wrote their own tweet to her thanking her for the gifts, asking her questions, and or talking about her book. The best part was that Ame tweeted every one of them back. I can assure you that was a day of smiles in my classroom. It's pretty powerful when a six and seven year old writes something to someone they look up to and that person takes the time to respond back to them. Here are some of those tweets, and some of Ame's responses. 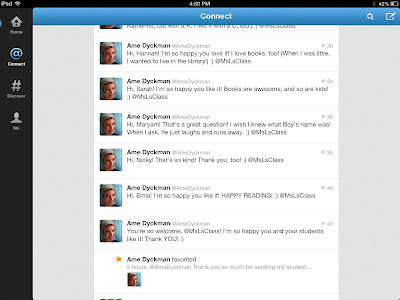 Ame Dyckman tweeting my students back. We also used twitter when we were learning about voice. Using the characters from Little Red Riding Hood we pretended to be one of them and tweeted out in their voice. My students tweeting in the voice of characters from Little Red Riding Hood. Just like the adults in a professional development conference my students have also used twitter to back channel. Discover Education puts on some great live streaming sessions. At one point this year we watched one from an aboriginal community in Canada. As we were watching my students were tweeting out their key learning points with other children to a specific hashtag. Not only was it a great way for them to synthesis their thinking, but it was also a great way to review what we had all learned but rereading the hashtag we had created. Sometimes we don't start out with the intention of using twitter but our conversations end up there as well. At one point this past year we were learning about the number ten. It was written about on our class blog and Mrs. Cassidy's class saw the blog post. They wrote us back a comment and quickly we replied to their comment. But we were worried because we weren't sure if they would know that we had replied back to their comment so.... we tweeted them instead. My students know that when you put the @ symbol in front of a specific person, or in this case a class name, the tweet will go into their mentions section and so they will get a notification. As you can see by the conversation in the image below they got our tweeted and responded back. It was a great way to learn with children a couple 1000 km away. A blog conversation moves into the realm of twitter. Another benefit we've had with using twitter in the classroom is that other people learn about us and come and visit the class and student blogs. It's a great way to make new connections and expand on learning. I do have some tips on using twitter in the classroom too. The first one is that's it's really important to inform your students' families that you'll be using twitter for learning. The reality is as much as I know how we can use twitter so often tweet ideas just pop into our heads when we least expect them. I try to be clear that we are using twitter as a tool for learning. I ensure my students' parents that we will never tweet last names and if we tweet a photo there will be no names attached to it. I also let them know that I approve every tweet that goes up. Student safety is very important to me. Now I've mentioned that my class twitter account is @MsLsClass and I think some of you may have gone out to follow them. Here's the thing though, we may not follow you back. My students read what is in our class twitter feed and so I need to be very careful with what I let them read. Right now we follow a handful of primary classes and some pretty cool people like Chris Hadfield. But we don't follow many others. If we connect with you as a class in another space - maybe we joined the Primary Blogging Community with you, or we did a collaborative project with you, then it's more likely we will follow you. But if you start using your class account to retweet non kid related posts the chances are we will unfollow you. Nothing personal but I do need to keep my students safe. Some of you are probably wondering how we get people to join the conversations on the hashtags we create. 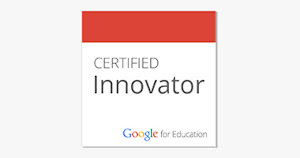 The first thing is that I, as their teacher, am a connected educator. This means that I do have connections to some really amazing primary teachers. So when I send them a tweet saying what my class is up to on twitter they will often join in the fun. But if you're new and your network is small it's just as easy to let a hashtag such as #1stchat or #2ndchat know what you're up to. Then you may find people from there coming to join in on your conversations. The key though is that if you are using twitter with your class you really should be using it professionally too. Why make your students do something you're not willing to do yourself? The same goes with blogging by the way, but that is a whole other post. Another thing you need to be aware of is when you create a hashtag it's a good idea to make sure no one else is using it for a different purpose already. This happened to me once this year. Thankfully there were no inappropriate tweets to the hashtag but a different hashtag was quickly created for our purpose. I hope these few ideas will help you give using twitter a try in your classroom this fall too. It really is a great way to learn with others. Curious to learn more? Check out this EduSlam where I am featured talking about using Twitter in an Elementary classroom. I'm planning to use Twitter with my class this year. I created an account. We will follow your class account as soon as we're up and running. Thank you! Please if I can help don't hesitate to get a hold of me here or through my twitter account @klirenman . I hope you enjoy using twitter in the classroom as much as my students and I do. I would like to do this but have some questions. Is there a way to hide what is trending on the left side so fifth graders don't click on it. Do you just watch them and approve before they hit the tweet button? Do they all know the username and password to login? I love all of your ideas. We use Twitter all the time in our 1st grade class too! I often have them write out their tweets first, highlight the capital at the beginning and period at the end, then they show me. I might correct a word or two to help fellow Twitter users understand the sentence. The kids love being able to tweet questions, statements and pictures. Thank you for the ideas and inspiration. As an aspiring teacher it is fantastic to see there are so many resources that can be used. I am particularly interested in the use of social networking in schools as it has so many positive attributes to the classroom. I would look to engage my students by having their own blog or twitter account. Thank you for your ideas. Thanks for wornderful post that you have shared with us. I love your ideas! I am a grade 2 teacher in Ontario. I sent home permission forms and got some back where the parents do not want any work/photos/or names (even first names) on Twitter. I respect this, but am wondering how I can make that student still feel included when others are allowed to tweet but they are not. Have you run into this before? If so, any ideas on how to be all inclusive while keeping the parents wishes in mind? I have had parents with concerns, not specifically with twitter but with other parts of our on line learning. One thing that I always do is try to find out what specifically their concerns are and then I explain what I do to keep their children safe. Sometimes that's still not enough so I find ways to make it work for their concerns and their child's learning. I always honour where they are at though. If it's still not something they are comfortable with this child (or children) can help you write tweets on behalf of the class vs from an individual student in the class. In my case that might look like a tweet that says, "Some of us think that it will snow tomorrow by Div 18". No one specific is mentioned but their idea is still being shared. I hope that helps. I have a personal account and when.trying to sign up for a class account it will not let me because of ny phone number being the same? Is there a way around this? I tried a different email and it still doeant work? I've never given a phone number on my twitter account but I do have different emails for my account and my class account. I'm not sure if that helps or not. Nice post and Twitter lets you connect with people, express yourself, and discover more about all the things you love.Would you like to connect with people via twitter check callgent. Thank you for all your wonderful ideas! I never thought of using Twitter in an elementary classroom before, but I am going to try it. What would you suggest I should do first? Thank you so much for sharing this! I am exploring the thought of incorporating Twitter into my first grade classroom and found this entry extremely insightful! This may sound silly, but as I think through all the logistics of even getting started, I am curious how you get permission for all your students to have their photographs published online. Do you have a permission slip specific to just your classroom and Twitter/your blog or is it a school-wide form? And do you have students that cannot be photographed? Any tips on that? I love these ideas, Karen! Tweeting from the class instead of just one student is brilliant! Also, providing a job or task for a student ,such as an editor is a wonderful idea! Our school does have a consent to photograph and publish waiver, but I think I will create one for my classroom just to be on the safe side and keep my parents informed. Thank you so much for replying to my comment and for posting such useful content! Good luck this year with your transition!